Stylish, fashionable and extremely popular, luxury rope handle carrier bags have become a firm favourite within the fashion and clothing industry. Also known as luxury gift bags, Elliott Packaging can create rope handle carrier bags to any size specifications, print design, and include added extra luxuries such as ribbon handles and UV inks. It’s the extra mile and attention to detail why Elliott Packaging have maintained a blossoming working relationship with Toodle Pip, a Scandinavian based clothing company who bring Britain’s most loved bands to Europe. 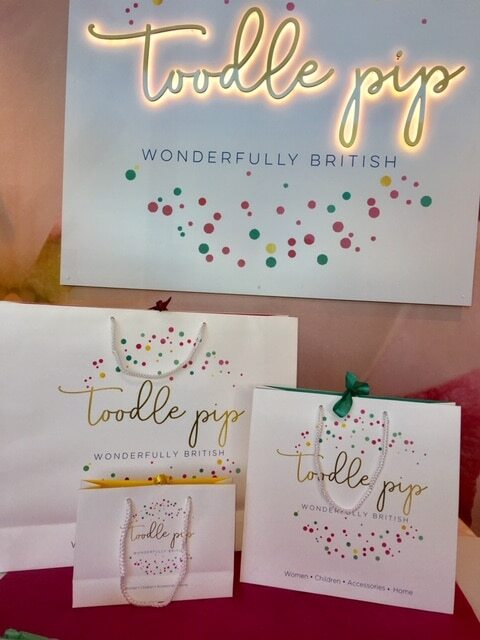 “At Toodle Pip we pride ourselves on sourcing the most Wonderfully British Brands to reflect our British roots. When it came to source a company to Manufacture our store bags it was essential, we found the right company who could reflect our company ethos through the bags. Elliott packaging was a perfect fit for us. The bags are top quality and like the brands we stock Elliott Packaging is also British! Elliott Packaging provided the flexibility to enable us to design our bags the way we wanted. We chose the style and size of the bags to ensure they fit our diverse range of products and also the colors. To add an extra special touch, we had three different sizes and each size had a different color inside to differentiate between the sizes. We also added a ribbon to give an extra luxury feel. The bags turned out amazing and really give the pop of individuality needed in the fierce retail industry to stand out against the competition. For more information on Toodle Pip, please visit their website. Are you looking for rope handle gift bag? Elliott Packaging can manufacture rope handle paper carrier bags can be made in any size to suit your product. With customers across the UK and Europe, we truly believe we can offer extensive product knowledge and competitive pricing. Elliott Packaging offer an extensive range of paper carrier bag products including twisted paper handle bags and flat kraft handle bags. To get started, give our paper carrier bag product sales team a call on 01606 350036 or you can instantly speak to a member of the team using our online chat facility.